Symptoms Of Allergies May Be… A Good Thing? Allergy sufferers, rejoice… sort of. While traditionally viewed as a gross overreaction to relatively harmless pathogens, symptoms of allergies (coughing, sneezing, red bleary eyes) may actually be a sign that your immune system’s working fine. Mild symptoms of allergies, according to new research, may be how bodies are supposed to work. While the immune system is made to kill pathogens, keeping them out can also be a type of defense, so it triggers our noses to run, our eyes to water, and our lungs to clear themselves, the throat, and mouth. The researchers even suggest that having such an uncomfortable reaction is a good way to keep us away from things that may not be good for us. Of course, this all refers to mild allergies—hay fever, as it were. People with severe symptoms of allergies still need to take precautions that things don’t reach a worse case scenario level (like anaphylactic shock). To help ease the pain of allergy season, make sure your indoors are free of things like mold, and that your air filters & ducts are changed or cleaned. Since pollen levels are currently high for the middle of the country, beware that symptoms of allergies might be particularly bad for the next week or two! Rinsing your eyes and nose with water (our sinus flooding kit makes it easy!) may help relieve symptoms of allergies. 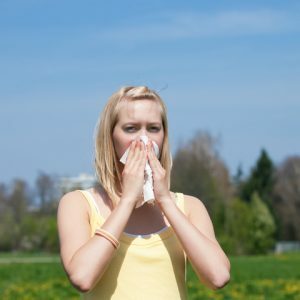 Do you have any good tips for avoiding symptoms of allergies? Share below!